We want to start this article off by asking why everything has to revolve around Gabi? Does the actress have a special deal with the writers/ producers because she has been thrown into too many storylines. Last week she was conveniently given a reason to kill Andre, which put her in this story. This week she had to be told about Lani’s pregnancy and of course made it about her pregnancy. Is it too much to ask that she isn’t always front and center? 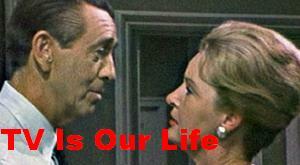 Will wanted to divorce Sonny so he could move on with his life. Sonny practically begged Will to give their marriage a chance, but Will wasn’t interested. We can’t say that we feel sorry for Sonny because we don’t. Sonny has an idea of how Paul felt when he viciously dumped him for Will. Speaking of Paul, he actually did the impossible. He actually heard John say that he poisoned Steve. People don’t usually hear things like that so it was a surprise that Paul actually heard it. This has the potential of being a good story. What does Paul do in this situation? Does he protect his father or does he look out for his partner? Roman and Anna were arrested this week after Rafe, Eli and Hope saw Anna go in Andre’s office. Rafe and Hope drove it home that they didn’t want Roman to lie for Anna. As we mentioned last week, Rafe did the same thing for Hope when she killed Stefano. Long time viewers know that Rafe did the same thing for Hope. Rafe went the extra mile and covered up Stefano’s murder. Should Rafe and/or Hope say anything about what Roman is doing? Lani proved again that she is a snake. Once again she was determined to let JJ think he is the father of her baby. She seems like she’s starting to believe her lie. She seems like she’s starting to believe her lie. She argued with Valerie about how far long she is and how JJ is the father as if she was telling the truth. The more lies she tells the worse it will be for her when the truth comes out. Speaking of Valerie, she deserves to be written up or suspended for looking at Lani’s file. Lani told her how far long she was, but Valerie took it upon herself to look at Lani’s file. Valerie has been a doctor long enough to know that a patient has a right to his or her privacy. Lani is not her patient so she didn’t have the right to look at the file.